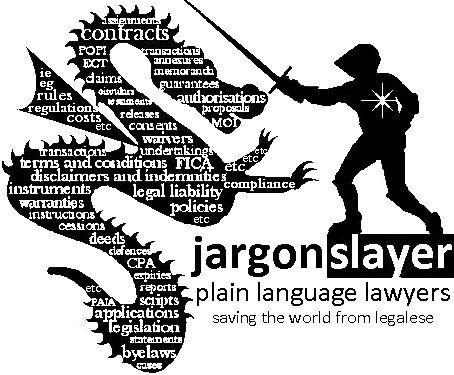 Become a fearless ‘jargonslayer’ with our iLEXplain: Plain legal language workshops. Do your customers understand your documents? Simple language in many contracts and legal documents has become a consumer right and a competitive advantage. Poor legal drafting has become a liability. Create clear legal documents and close the gap between your business and your clients. We offer workshops, seminars and executive briefings on plain language. Our current focus for intensive workshops is plain language in financial services, insurance, and healthcare related documents. Understand how plain language law and practice affects and can benefit your organisation. Identify unnecessarily complex language in a legal and business context. Learn practical techniques for drafting or editing legal documents in plain language. Plan successful plain language projects in your organisation. Reap the dividends of converting your organisation to plain language. An overview of the laws that define and deal with plain language. What are the benefits of using plain language? What are the risks of using plain language instead of legalese? An outline of some of the most important plain language principles. Some effective techniques and tricks for writing in plain legal language. Related principles such as document structure, design and typography. Examples of how to write common legal words, phrases and clauses in plain language. Successful plain language projects and the role of style guides and glossaries. Things you can do in your organisation immediately and other action items. Practical plain language writing exercises. So does it make sense for me to attend a iLEXplain: Plain legal language workshop? We will give you copies of the presentation, useful checklists and further reading lists. Managers – to manage the legal documents that relate to their products or business. Marketing managers – to market legally and effectively using plain language principles. Communications and PR professionals – to learn techniques for more effective communication. Lawyers, in-house legal advisers and paralegals – to draft good documents and provide good advice. Auditors and assurance providers (internal and external) – to provide plain language assurance. Risk managers – to manage risks regarding complicated or unlawful language. Compliance officers – to effectively comply with plain language laws. A practical attorney from Michalsons. We will ensure the attorney is the best person to present the course depending on the type of course, the date, the specific issues and the attendees. For example, Andrew Weeks often presents on this topic. He is a practical and internationally experienced commercial attorney, with specific expertise in plain legal language and consumer protection law. He is a fanatical plain language lawyer who drafts, edits and audits a wide range of agreements and other legal documents using plain language principles. He enjoys educating clients and colleagues about plain language. Our public events are at various venues around the world. We choose venues that are central and easy to get to, that have adequate parking, good food, and that ensure you are comfortable. We are also happy to give the iLEXplain: Plain legal language workshop or executive briefing at your venue. ‘We had some great feedback from the teams’. ‘I just wanted to say a quick thank you from my side for your recent training sessions…. We’ve received very positive feedback yet again’. Many thanks for the copy of the workshop presentation, Andrew! Much appreciated. And thanks too for the well-presented session. Beautifully clear. Thanks for the seminar. Our Group Legal Counsel will be contacting you regarding giving a seminar to our global legal meeting in January’.